Their work brings together the physical and digital spaces. 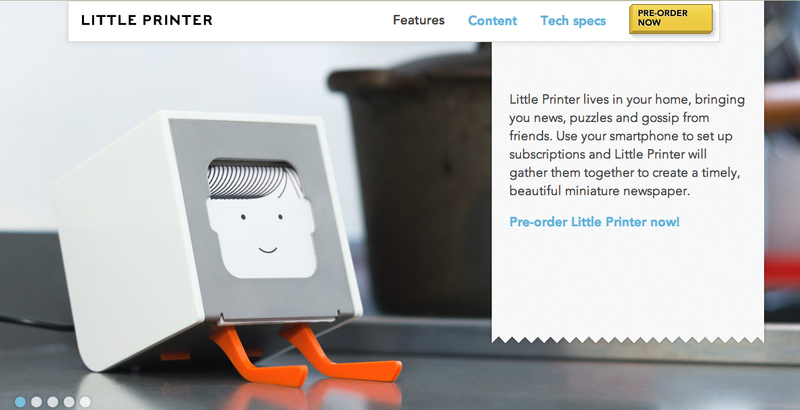 One project I found interesting is “The Little Printer” available for pre-order for mailing in November 2012. 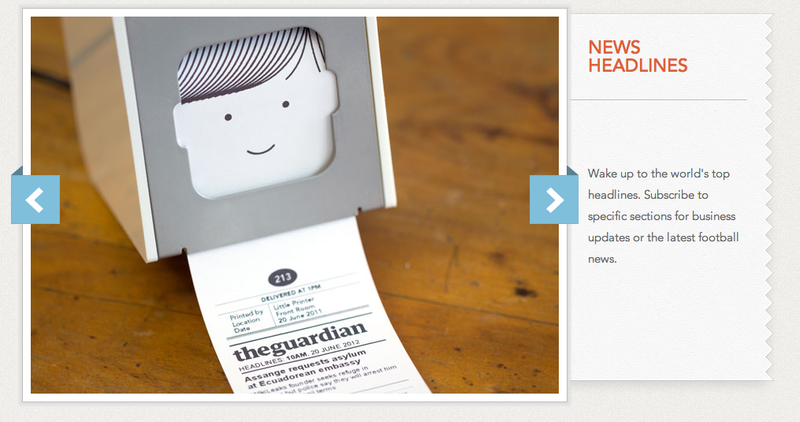 The cost is $259 to get your digital news feeds printed out on paper to read. This printer will bring together your social media from your smart phone and print out a “little newspaper” for you to read, pin-up on your refrigerator or tack to your desk so you never skip a beat again. I find this very “retro” as the GQ editor mentioned in an articled I posted below would say, since it is using technology to spit out lists that we could easily create by hand. Rather than reading something on-screen, supposedly the best part of being online, it does the opposite and prints out what we create online. I like that. I am not sure how sustainable this is, but it’s a move backwards to understand our actions going forward. I am now wondering how the digital in a physical form can be represented in another way? Maybe for my next prototype. What do we lose with new media? Doing everything on the screen makes us lose touch (literally) with traditional forms of media. We focus on the visuals, not the act of making. I am interested in going back to old media. Bringing pen to paper and eyes to pages of a book. Keeping in touch with reality. These projects bring the digital space into the physical space. 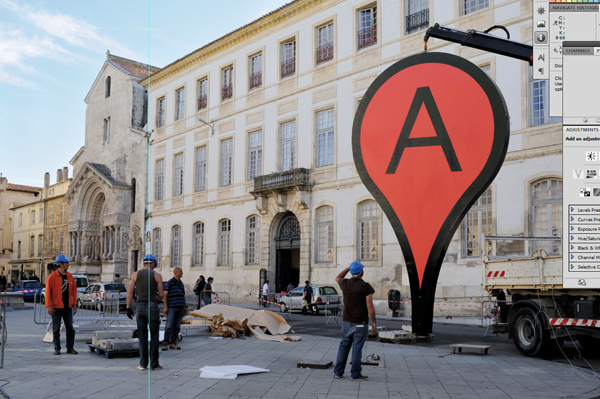 Maps intrudes the physical space with this very “life-size” marker but the Media Surfaces explores how seamlessly our virtual world can be placed into the physical. 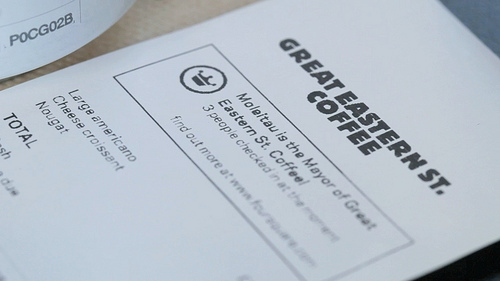 Print can be quick: This sequence shows a common receipt from a coffee shop and explores what happens when we treat print as a highly flexible, context-sensitive, connected surface, and super quick by contrast to say video in broadcast. How is technology intrusive on relationships? Do we suffere from information overload? How do we deal with it? Does technology separate people in real space? What is lost through virtual communication that can’t be replaced? How is digital culture is subversive to human relationships? Why do we accept every new technology with open arms? Do we think everything is good for us? What does it say about how technology relates to status? WHY are we using them? I started working on my “Elevator Pitch,” a short 30-second run through of my thesis idea. I thought the best way would to attach a link because it might be changing in the next couple days (or in the course of the semester) as my ideas change.